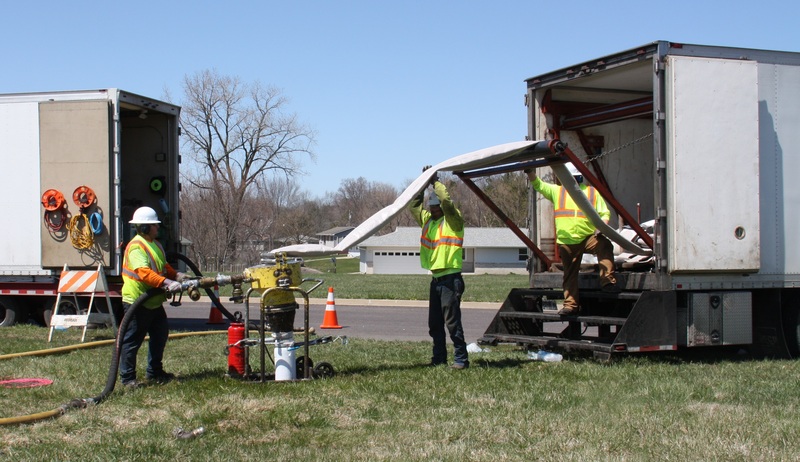 CIPP offers a proven trenchless repair of aging sanitary and storm sewer pipes. Digging to replace old infrastructure is expensive and disruptive making it impractical or infeasible in many scenarios. Roots, infiltration, and all but the worst broken pipes can be repaired in place without a disruptive digging operation. CIPP offers a minimum 50 year lifespan replacement at a fraction of the price of new pipe while also leading to increased pipe capacity due to reduced friction loss. Our proven history has been built using materials sourced from industry leaders that, like Hoerr Construction, have been on the forefront of using and refining this technology. All work is performed to ASTM F-1216 and NASSCO standards. A resin impregnated flexible tube is inverted inside of the existing pipe using either air or water pressure. Once the tube is completely installed and inflated, it is cured by adding heat to the interior of the pipe. The heat causes a reaction within the resin that leads to polymerization, or hardening, of the resin into a plastic pipe that is a full structural replacement of the existing pipe. Service connections to the mainline that are sealed off during the process and are then reinstated using a robotic cutter. Back to the Services Page.